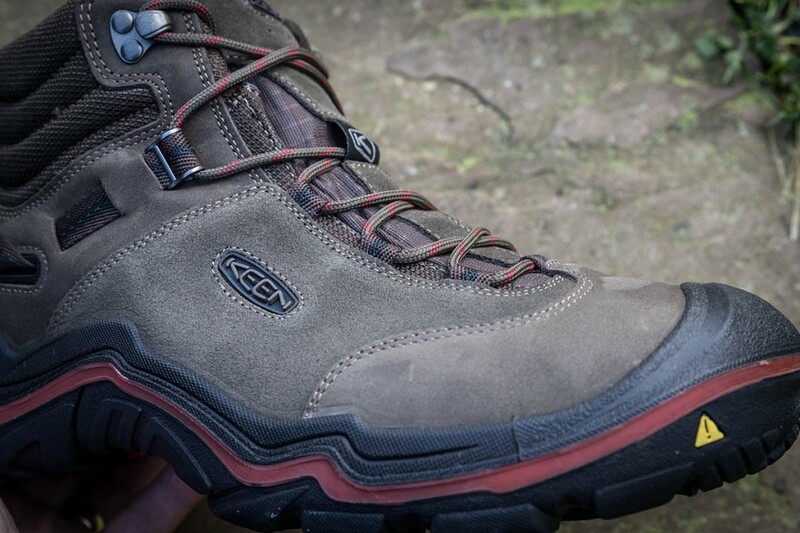 These new Keen boots are just hitting the shops and are a product of the American brand’s new European factory in Romania. The last is designed to fit a more European foot shape and feel. 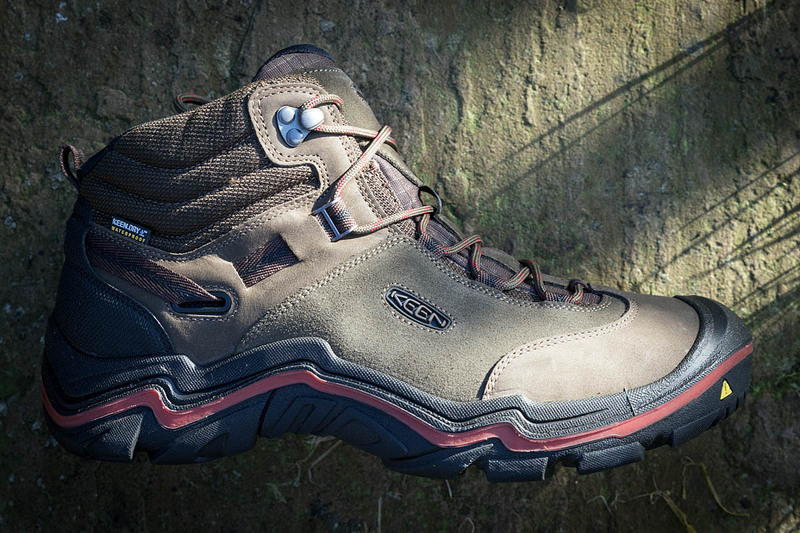 The forefoot on the Wanderer is quite wide and first impressions when putting on the boot is of instant comfort. The design of the Wanderer is of a trail shoe that has been extended upwards to provide the ankle protection of a boot. The mixed leather and suede uppers are soft enough to provide that comfort but feel sturdy enough to resist the scuffs you’re likely to encounter in the great outdoors. The polyurethane midsole is direct-injected on to the uppers and there’s a dual-compound outsole. The toe area extends upwards a little way to give extra protection, and the heel has a similar extension. There’s also a reinforced heel cup wrapped around the leather upper. The ankle cuff is soft and well cushioned and the upper part of the tongue is also cushioned. The EVA insole, which Keen calls its Metatomical Footbed, has a reasonably padded front section, which also has vent holes. The mid and heel section has an underlying support structure, again with vent perforations, with a foam upper section. The heel of the insole has an oval indentation on its lower side which fits on to a corresponding heel cushion built into the midsole. For this reason, Keen doesn’t recommend the use of after-market insoles as these won’t fit with this cushion. In use, this whole set-up cradles the underfoot well and keeps it in place. Combined with the shock absorption provided by the polyurethane midsole, this makes for a comfortable walking experience, and after long outings, there was little fatigue on the soles of our tester’s feet. The outsole of the boot, with a combination of two different compounds, provided good grip in both the dry and wet. Traction on grass and rock was very good, and on mud was good. Downhill braking was equally good, and made for assured ascents and descents on our test routes. The Wanderer has Keen’s own Keen.Dry waterproofing membrane which kept the rain out and breathed reasonably well. The lining of the boots is a hydrophobic close mesh material and coped quite well with moisture. The lower rear section of the lining has cushioning too. Lacing of the boots is simple, perhaps too simple. Fabric loops comprise the bottom three ‘hooks’ and the fourth is a similar fabric loop with metal reinforcement which works well, via a webbing strap encompassing the lower ankle, at keeping the whole foot in place in the boot. There’s then just the top open hooks to tie round. We found it difficult to get enough tension to make the ankle cuff snug around the leg without the feeling there was some movement around the ankle when in use. It took a very determined tug of the laces to cinch the generously padded ankle section close around the ankle. Once achieved, and locked with an extra hitch and a double knot, there was no movement. We’re not keen on feeling any excess movement as this can lead to problems such as blisters. In this case, it’s pretty unlikely to lead to this because there is so much padding in the ankle cuff and tongue, but it does leave a bit of a gap for stones to enter. No other movement was felt in use: there was no heel lift or sliding forward of the foot to cause toes to hit the toe box. The Wanderer is Keen’s innovative boot-that’s-more-like-a-shoe concept. 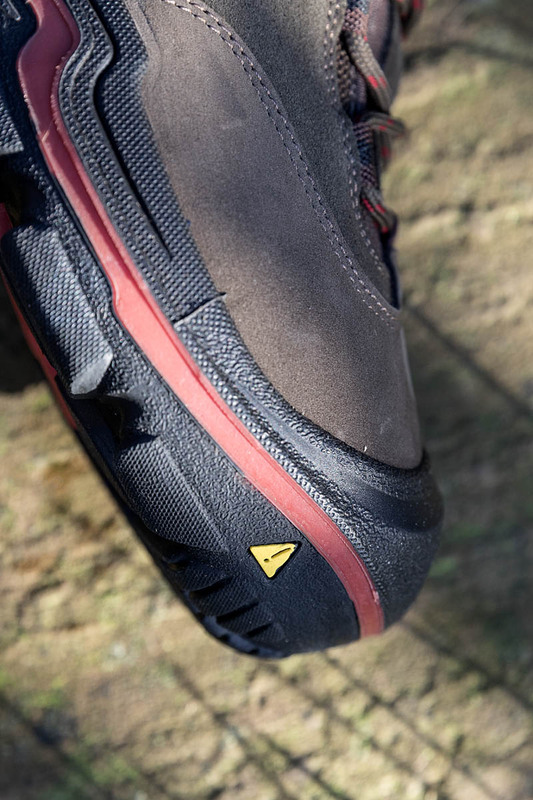 Its three-quarter height gives the protection around the ankle of a boot, plus the ability to splash through puddles without the danger of getting water down your footwear, but with the comfort of a shoe. And it that sense, it works well. The Keen Wanderer is very comfortable. If we were heading out on a long walk on easy to middling terrain, it would be our choice of footwear. It won’t give the protection on difficult ground of a true mountain boot, but it will take you on those hill trails as well as being comfortable enough to wear in urban situations. Arch and heel support, plus all-round cushioning meant foot placement felt assured yet comfortable. And it’s priced pretty competitively too for a versatile piece of footwear. It does provide genuine out-of-the-box comfort, yet grip on rock, grass and mud was comparable with proper, full-on boots. Sizing is probably about a half-size on the small side. 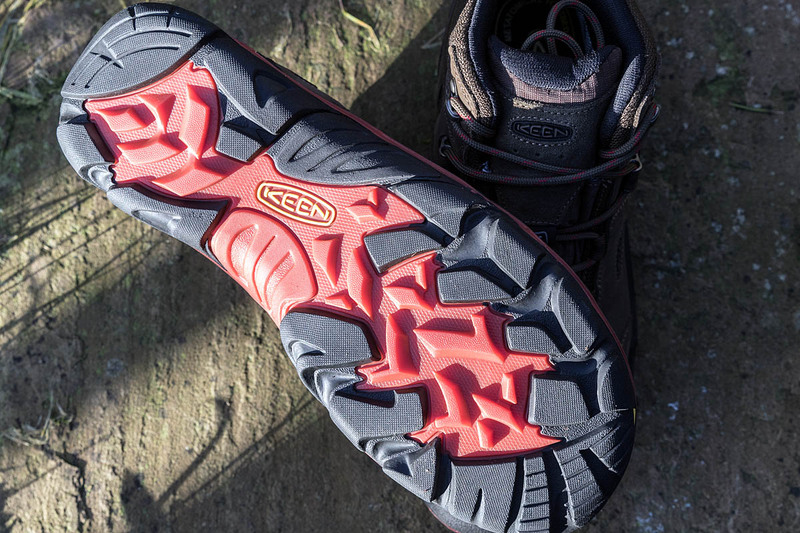 We usually take a 9½/44, but Keen provide a size 10, which felt just about right. More details are on the Keen website.